On Jobs, Bad News Is Bad. The Good News Is Bad, Too For the second month in a row, weak job growth numbers unsettled nerves in the White House and on Wall Street. But why wasn't the drop in the unemployment rate viewed as good news? 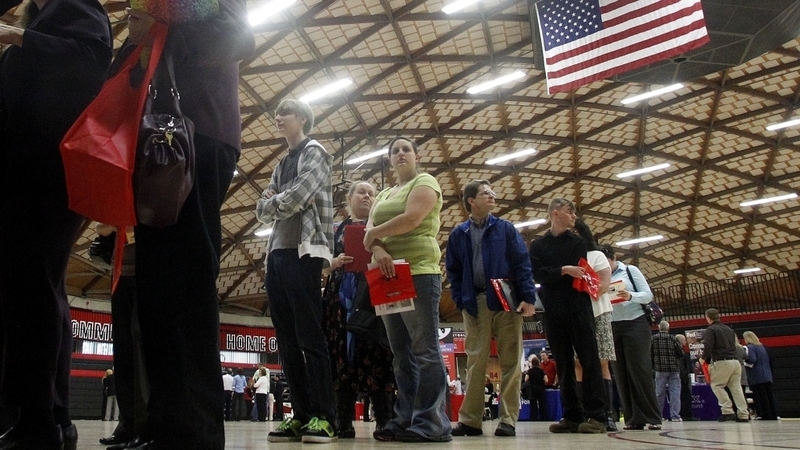 People wait in a line at a job fair on April 10, 2012, in Gresham, Ore. Employment grew by 115,000 last month, but the unemployment rate dip was likely due to people leaving the workforce rather than people getting hired, analysts say. For the second month in a row, weak job growth numbers unsettled nerves in the White House and on Wall Street. 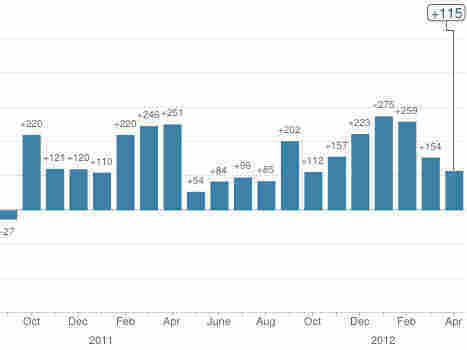 It's obvious why the number of jobs added to the economy in April was disappointing. Employment grew by just 115,000. That followed a disappointing job gain in March. Together, the March and April average was only about half the 250,000 jobs added monthly in December, January and February. Again, economists suggested the warm winter weather might have boosted job growth during the winter months, which left fewer jobs to be added in the spring. However, at first glance there appeared to be a silver lining in April's numbers: The unemployment rate inched down again to 8.1 percent. "For the last couple of months we have a situation where the unemployment rate is still declining, but that's because people are leaving the workforce," says Gary Burtless, a labor economist at the Brookings Institution. He says it's usually good news when the unemployment rate drops, because lots of people are getting hired, but that wasn't the case in April. Some people might have left the workforce because they reached retirement age, and it's possible they weren't replaced by young people, who may have decided to stay in school because the job market is still dicey. Yet there's no doubt many people left the workforce because they're discouraged. After months of looking, they still couldn't find a job. Kate Riley, a former health spa manager from the San Francisco Bay area, is one of them. "I was sending out anywhere between 5 and 10 resumes weekly; was getting ignored for probably half of them, but the half that did respond the comments were very complimentary for my expertise and my experience and they did want to talk to me," she says. In some cases Riley even went through half a dozen interviews with a potential employer. But after more than a year of looking in the spa industry, Riley, who's 61 years old, never got a job offer. "Someone else was getting chosen because they fit the culture better and I recently realized that that was code for I'm older and it doesn't fit the image that they want to project," she says. Last week Riley decided to stop looking. "It was somewhat humiliating and very depressing," she says. "It was a shock to realize this isn't working, because I tend to push on and push through and last week when I just decided to stop, it was an emotional change for me." So, after a long successful career, Riley, like a lot of people in today's job market, is going to have to find a new path.